H.R. Niebuhr (1929) was the first sociologist to distinguish between a church and a denomination. His distinction was based on a study of religion in the U.S.A. Denominations share some, but not all of the features of churches. Examples of denominations include the Methodists, the Pentecostals and the Jehovah’s Witnesses. Like churches, denominations draw members from all sections of society: they are inclusive. Like churches, denominations have formal organisations and are hierarchically organised with a bureaucratic structure. Denominations do not claim a monopoly on truth. 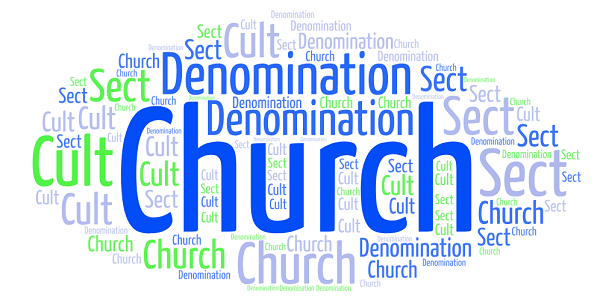 Unlike churches, a denomination does not identity with the state and believes in the separation of church and state. Some denominations place more restrictions on their members: for example the Methodists and the Pentecostals. Steve Bruce suggests that denominations have become more important in society with the rise of religious pluralism. The concept may be too broad to be useful. There is disagreement over whether certain religious organisations should be classified as sects or denominations. Ernst Troeltsch (1931) used the term ‘church’ to refer to a large, hierarchically organised religious institutions with an inclusive, universal membership, typically with close links to the state. Churches tend to have very large memberships, and inclusive memberships. Churches tend to claim a monopoly on the truth. Churches tend to be closely tied to the state. Steve Bruce (1996) suggests that the above definition of church may have been true in pre-modern Christian societies, but ever since the Reformation, and especially since the increase of religious pluralism, this type of definition of a ‘church’ no longer applies to organisations which formally call themselves churches in modern societies – organisations such as the Church of England. The Church of England does not have universal membership. Many churches today do not claim a monopoly on the truth, they tend to be tolerant of other faiths. The links between the church and the state are not as strong as they once were. It seems then, that the only ways in which modern churches resemble Troeltsch’s definition lies in their organisational structure.